The IoF occupies close-to 5000 sq feet of laboratory space including a BSL (Biosafety Level 3) suite, (Figure 1), which is equipped with 3 large fume hoods, a level 3 hood, benches, cupboards, solvent cabinets, upright fridge freezers, Thelco laboratory ovens, gas, air, nitrogen and vacuum lines, desks, photocopiers and working space for the IoF staff. For Surface Preparations the IoF is well-equipped with all the necessary equipment to undertake the aims of this proposal, including a BOC Edwards Vapor deposition Module (Auto 306), a vacuum oven (Fisher Model 280A), a Harrick Plasma cleaner (Model PSG-32C) a Brinkmann/Büchi SafetyVAP Rotary Evaporation System as well as an array of smaller items: analytical balances; hotplates; pH, conductivity meters; large capacity vacuum desiccators; sonic baths and glassware (quick-fit apparatus) etc. The BOC Edwards Vapor deposition Module (VDM) is used for the deposition of continuous metal films onto solid substrates. The VDM uses the thermal evaporation technique with an oscillating crystal thickness monitor, and can be used to deposit metals in excess of 50 nm thick. A variety of metals can be deposited including, but not limited to, Gold, Silver, Aluminum and Copper. In addition, binary metallic layers and oxides can readily be prepared using this system. The Harrick Plasma cleaner is a compact tabletop unit with a 3" diameter by 7" long chamber and is used for surface applications such as contaminant removal, activation, prebond preparation, surface chemistry modification, polymeric grafting and coating. The plasma cleaner creates ultra clean surfaces, and can also be used for sterilization, wettability alteration, enhanced surface properties and enhanced bonding. A vacuum oven and vacuum line system (liquid N2 finger) is available for the storage of freshly prepared samples as well as thermal (vacuum) annealing up to 250°C. A spin-coater from Chemat Technology Inc.(Northridge, CA) Model KW-4A is used for precise and uniform deposition of thin films and coatings. A two-stage spin process allows dispensing at low speeds and homogenizing coatings at high speed. The KW-4A spin coater can be used to deposit metal oxide thin films, polymer coatings and organic thin films. Laboratories at the Institute of Fluorescence are very well equipped for Cell Culture and Microbiology, including a Fisher Isotemp Water-Jacketed CO2 incubator, Fisher micromaster inverted microscope for cell counting, Fisher Accuspin 400 swinging bucket centrifuge, ISTM ultra low freezer (-86°C), Barnstead Locator 4 Cryogenic Storage System, liquid nitrogen tank, Fisher-Hamilton SafeAire Class II Laminar Hood (BSL 1, 6 ft.) and two New Bruinswick Scientific Shakers for the preparation and the characterization of cells used in cell culture and biology. The Fisher Isotemp Water-Jacketed CO2 incubator has a 3.0 cu. ft. environmental chamber. The operating temperature range is 5° above ambient to 60°C with temperature stability of ±0.1°C at 37°C and uniformity, ±0.2°C at 37°C. The operating CO2 range is 0 to 20% with ±0.1% stability and uniformity, ±0.2%. The Fisher micromaster inverted microscope has a 30W halogen light source. This microscope permits observation of critical live cultures and large specimens in all types of culture vessels and microtiter plates. Its built-in-stage window allows one to see which objective is in use without removing the specimen from the stage. The microscope includes a fully integrated digital video camera for Plug-and-Play compatibility with desktop or laptop PC via its USB port. The Fisher Accuspin 400 swinging bucket centrifuge is a versatile small-volume (capacity: 4 x 100mL) centrifuge. It can be used as a microcentrifuge with a fixed rotor, or for high-speed or general purpose separations with precise speed control to 13,000rpm (16,060g).The ISTM ultra low freezer (-86°C) is ideal for general storage uses providing a secure storage of anatomy components, DNA, RNA, biological products, viruses, vaccines, and tissue samples. The freezer has a solid-state control system with adjustable temperature set-point and maintains reliable storage temperature from -86 to -50°C. The Institute of Fluorescence also houses a Barnstead Locator 4 Cryogenic Storage System, which is used for ultra-low temperature storage for biological samples without the need for electricity and can accommodate up to 4000 ampules for 122 days. The Fisher-Hamilton SafeAire Class II Laminar Hood is a safety cabinet for the handling of biological samples to prevent the contamination of the biological samples and the laboratory environment. UV lamp provides ultraviolet radiation to decontaminate the work area. The Laminar flow hood is designed for operations requiring Biosafety Level 1 or 2 containment- such as culture analysis and bacteriological and virological applications. New Bruinswick Scientific Shaker provides a temperature and humidity controlled environment (from 7°C above ambient to 60°C) for the growth of cells, bacteria and other cultures with constant stirring. An autoclave is also available for the sterilization of glassware. A Nanopure Diamond Life Science (UV/UF) water purification system is available for molecular biology applications including PCR, electrophoresis, cell and tissue culture and includes a dual-wavelength UV bulb and an ultra filter. It is the only validated water system with the ability to remove nucleases such as RNase and DNase, as well as DNA, from challenged feedwater. Produces 0.40 gal/min (1.5L/min.) ultrapure water containing <0.005Eu/mL of pyrogens, TOC values <3ppb, and resistivities up to 18.2 megohm.cm. Finally, the IoF is also equipped with a Criterion™ Blotter Assembly (Western, Northern, Southern Blotting), blotting cell accessories, and a PowerPac200 Power Supply, which are used to perform protein analysis with SDS-PAGE gels and separation analysis of protein samples with Western blotting methods. In addition, the versatility of the Criterion™ Blotter also provides the necessary tools to execute RNA and DNA studies with Northern and Southern blotting techniques. Optically. The IoF is very well equipped with fluorescence and other optical equipment, such as spectrophotometers (2*Varian UV/VIS 50), temperature controlled sample chambers and HTS plate reader, a Varian Cary Eclipse Fluorometer with HTS and polarizer accessories, three Ocean Optics HR 2000/4000 High-Resolution Fluorescence Spectrophotometers equipped with an inter changeable 1000/600-micron fiber optic system, in-line filter holders / optical condensers etc, an oxford instruments variable temperature cryostat with interchangeable windows, a 560x Leica M-series fluorescence microscope with various objectives, filters, light sources, color CCD camera and other ad-on’s, various PMT detectors, automated shutters and fiber couplers, Time-Correlated Single Photon-Counting instrumentation (TCSPC) as well as a SPEX / Horiba MF2 instrument, above image, (Frequency domain) in the ps-second temporal region for the collection of fluorescence and phosphorescence lifetimes (many laser / LED excitation sources), as well as other optical components such as prisms, lenses, polarizers / beam splitters, filter wheels, doubling crystals, micrometer XY stages, regular band-pass and interference filters, both absorption (microscopy) and reflectance neutral density filters and a collection of notch, super notch and razor edge filters. 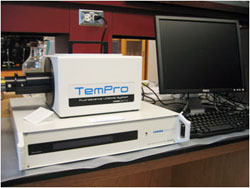 A Spex TemPro fluorescence lifetime system (below image) also provides for lifetimes to be determined in the time domain, in addition to the MF2 instrument, which measures lifetimes in the frequency domain. Many of these components are housed on three 6*4*1 ft Newport laser tables (55 psi) as well as 6*4*0.8 ft laser table in the BSL 3 suit. The IoF is also equipped with a Silver 420M MWIR thermal imaging camera / system with optics, for high frame rate thermal imaging in the region 3.6 – 5.1 mM, 0-150 C, with a thermal sensitivity of < 20mK. Two Thermo high-throughput plate reader systems also allow for measurements to be undertaken in HTS plates of virtually any density. The IoF is also equipped with an ISS Alba Fluorescence Correlation Spectroscopy Confocal system with adjustable z-axis objective translation (10 nm increments), top image. Microwave: The IoF is equipped with a microwave synthesizer that provides signal generation over a range of synthesized microwave frequencies and power levels. It is capable of generating output signals from 10 MHz to 20 GHz. The radiofrequency output can be modulated in AM, FM and PM modes. The synthesizer output radiofrequencies can be amplified up to 100 W using a linear amplifier. By coupling the amplified output to a horn antenna (A. H. Systems, Model SAS-571), we are able to generate directional, tunable radiofrequency signals (microwaves) with variable output power. Computer: Dr Geddes's office is equipped with PC's which are used for data analysis using various fluorescence deconvolution software packages, such as IBH’s DAS6 and Picoquant’s Timeharp software. Dr Geddes's continually updates his computer hardware and software, as the Journal of Fluorescence, the new Springer journal Plasmonics, Society of Fluorescence, Reviews in Fluorescence, Reviews in Plasmonics and Who's Who in Fluorescence annual volumes are all administered from his office. In addition, laboratory PC’s, laptops, high resolution printers, laser printers (all networked), scanners and digital cameras are readily available for Dr Geddes’s, Professors, postdoctoral, Lab tech and secretarial staff in his labs for data analysis and writing. The labs and offices are also well-equipped with software packages including, MSOffice, Sigmaplot, Norton Products, Mathcad, Adobe products, Coral draw, Chemdraw and Mathematica, to name but just a very few, under both group University and single licenses. High-end Computational Resources: The IoF also has licensed FDTD software from Lumerical Solutions, Inc., which provides a means to solve Maxwell’s equations for structures that have complex geometries and/or widely varying electromagnetic material properties for a wide variety of microwave field sources. With this software package, we can record time domain information at any spatial point (or group of points) and the frequency domain information at any point (or group of points). In order to effectively and efficiently execute the FDTD simulations, the IoF is equipped with a Dell 690 workstation that is equipped with two 2.66 GHz 64-bit Dual-Core Intel® Xeon®5150 series processors for a total of four execution cores in two sockets. Intel Xeon processors can deliver substantial performance enhancements over single-core Intel processors for computational intensive applications, such as FDTD simulations. The new Dual-Core Intel Xeon 5100 Series are based upon a new architecture, Intel® CoreTM micro-architecture, that has lower clock speeds and faster front side bus designed to deliver higher performance levels than previous generation Xeon processors. In addition, the workstation is equipped with 8 GB of ram, and it is further expandable up to 64GB in four fully-buffered DIMM channels (with an optional memory riser card). The IoF also operates a fully operational BSL 3 facility (BioSafety Level 3, 10.6*10.6 ft) directly next to the IoF laboratories. The BSL 3 is equipped with a 6*4*0.8 ft Thor labs laser table with self-contained electrical pumps for maintaining the table at 55 psi. The BSL3 suite is fully equipped with sole dedicated freezers, refrigerators, sinks, adequate bench space, table top centrifuges, water baths, incubators, hot plates, glass ware, sonic baths, spectrophotometers and other general laboratory equipment. A pass-through autoclave also connects the BSL 3 facility and an anti-chamber for the decontamination and passage of glassware. The BSL is also equipped with dedicated lasers and optics for use on the laser table. In addition to the extensive instrumentation of the IoF, access to the resource for Multiphoton Microscopy is also available, which is a shared facility located in the Medical Biotechnology Center (MBC) of UMBI. 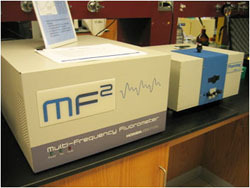 This facility, which was funded by the National Science foundation Major Research Instrumentation program, is available to all campus researchers who wish to incorporate microscopy techniques in their research programs. 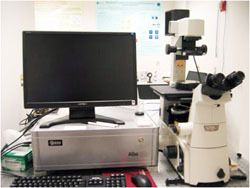 The instrumentation centers on a Zeiss NLO LSM510 confocal microscope system. Excitation sources include 457/488/514 nm Argon, 543 nm HeNe, and 633 nm HeNe lasers. A coherent Mira 900F Ti:Sapphire laser, pumped by a 10 Watt Verdi solid-state laser, is available for multiphoton excitation. 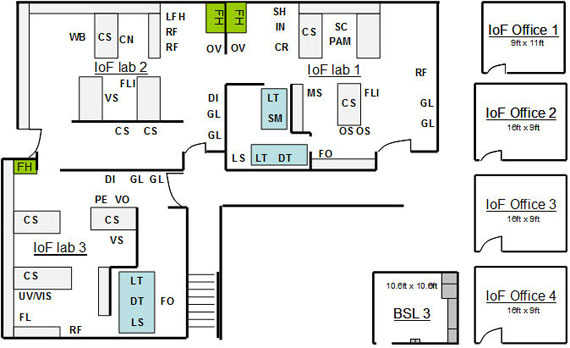 Figure 1 – Institute of Fluorescence (IoF) floor plan. IoF lab 1 is » 900 sq. ft, IoF lab 2 is » 900 sq. ft, IoF lab 3 is » 900 sq. ft. CN-Centrifuge, CR-Cryogenic Storage, CS-Chemicals, DI-Water Purification System, DT-Detectors, FH-Fume Hood, FL-Varian Fluorometer, FLI-Fluorescence Lifetime Instrument, FO-Extensive collection of fluorescence detection fiber optics, FR-86C Freezer, GL-Glassware, IN-CO2 Incubator, LFH-Laminar Flow Hood, LS-Lasers, LT-Laser Table, MS- Inverted Microscope, OS- Oscilloscopes, OV-Oven, PAM-Picoammeter, PE-Plasma etcher, RF-Refrigerators,, SC-Super Computer, SH-Shaker, SM-Fluorescence Correlation Spectroscopy confocal microscope, UV/VIS-Absorption Spectrophotometer, VO-Vacuum Oven, VS-Vacuum Sample Storage, WB-Western Blot. HTS – Two high-throughput plate readers, fluorescence and chemiluminescence respectively.